In 27 years as a high school baseball coach, Gladstone's Casey Webster has seen good teams, bad teams, and everything in between. This year's Gladiators? They've got the potential to be something special. "I've been here a long time and I think this could be one of the better teams I've had since I've been here," Webster said before Gladstone's season opener at Astoria. "The kids are great kids and they're coachable. We've got five seniors on the team, all five seniors start, and we get pretty good leadership from them, so I feel pretty good about we've got." The Gladiators return eight of their nine starters from last season's 13-11 team, including all-league, first-team picks Damian Alvarado in center field, Austin Conner at second back, and Otis Lundgren at catcher. 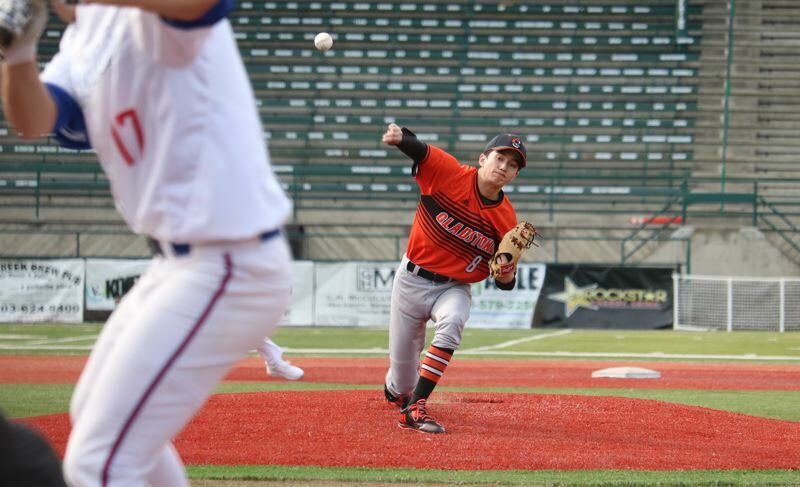 Shortstop Matthew Kuhn and first baseman Derek Lee were named to the all-league second team last season, and left fielder Matthew Lehrbach earned honorable mention. Ben Hill starts in right field, Ben McCoy is at third, and Max Dean, Jake Gehrke, Tyler Meyers and Jackson Simmons also figure in the mix depending on which of the Gladiators' six pitchers -- Conner, Kuhn, Lee, Lehrbach, McCoy or Wesley Haverland -- is on the mound. "If our pitching is what I think it is, it will take us a ways," Webster said. "Our defense is pretty solid, too. We're good in the outfield, we've got speed, we're strong up the middle, and behind the plate, when Otis is healthy, he's as good as anybody." Webster had taken 12 teams to the OSAA playoffs, including one that reached the finals in 2004, another that advanced to the semifinals in 2015, and two others that got as far as the quarterfinals in 2003 and 2009. Last season, the Gladiators finished third in the Tri-Valley Conference, one game behind league co-champions Estacada and Molalla. They qualified for the play-in round and traveled to Astoria where they took a 2-1 lead into the seventh inning before falling 3-2 in eight innings to the Fishermen. Gladstone followed that up with a strong showing in the Oregon Independent Baseball Association summer league, playing in the same division with 6A Beaverton, Reynolds, Tigard, Tualatin and Sunset. "The summer that we had helps," Webster said. "We made the OIBA playoffs, so the kids know that they can do it. We've got the pieces. We've just got to play." Gladstone (1-2) opened the season with a 7-0 win at Astoria, followed by a 4-1 loss at North Marion and a 6-2 loss at Banks, while Thursday's home opener against Philomath was postponed by rain. Through three games, Conner has had the most-potent bat in the lineup, hitting .667 (6 for 9) with a double, a triple, and two RBIs. The rest of the Gladiators are batting an anemic .106 (7 for 66). The Gladiators are scheduled to travel to Southern California during spring break to play in the Rancho Cucamonga Tournament beginning Monday. BANKS 6, GLADSTONE 2: Hayden Vandehey went 2 for 3 with a triple and scored two runs, pacing the Braves to a non-conference win Wednesday over the Gladiators at Ron Tonkin Field in Hillsboro. Gladstone took a 1-0 lead in the first inning when Derek Lee was hit by a pitch, Otis Lundgren and Austin Conner drew two-out walks, and Lee scored on a wild pitch. Banks answered against Glads' starter Ben McCoy with two runs in the first, three in the second, and one in the third to open a 6-1 lead. Conner led off the Gladstone fourth with a single to extend his hitting streak to three games to open the season.